Anyone can say they are great. Without verification, customers cannot distinguish the real business star from the braggarts…and they know they can’t! That is why they flock to online sources purporting to tell the real story. Ninety percent of new customers check you out before buying. What do they see? What will they see next month? Unless you take the right steps to change it, what they will see is a hodgepodge of reports of mixed relevance and results. You need to find a way to have them see a credible report accurately reporting your superior customer satisfaction record. But you can’t just announce it on your own — whether true or not, most will view that as simple bragging. If only you could be assured that they see the Pulse of the City News report of your Customer Satisfaction Award when they check you out online. But you can! We will explain how in a few moments. Customers are hungry for useful evaluation information. They know they can’t simply rely on a seller’s bragging claims, so they look for third-party reports. You can’t control much of what they will see about you online. But you can ensure that they learn of your Pulse Award — if you take our basic simple steps to market your award status! To see how our Pulse Award rating is viewed by customers compared to the usual rating sites, check out the comparison below. They are going to see the other sites and lists. So do you want them to also see your great Pulse Star Award news? Of course! 1. Your star page will be your calling card. Find it, review it and use the URL immediately in all social media. 2. Review the special customer marketing packages that include custom-designed materials and services to help you get the message out to customers, prospects and staff. 3. Manage your reputation and SEO by leveraging the award in press releases written with the help of our staff. The Pulse Award rating has rare third-party credibility that any company would covet. And you have it, so use it. Spread the word with our marketing packages, which provide all the tools you need. 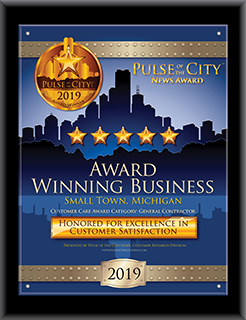 We congratulate you on your high customer satisfaction rating and encourage you to contact a Pulse Customer Satisfaction Award marketing consultant (866-732-9500 or customercare@PulseoftheCityNews.com) or browse our site to learn just how many ways the award can help your company.